Starting a blog can be confusing when you don’t know any basics of it. I have seen people making 6-figure monthly income from their blogs, and it proves why every another human is getting ready to launch a billion dollar blog. One thing you need to decide before starting your blog is an excellent blogging platform. WordPress is a popular Content Management System (CMS), and it powers 26.4% percent of the web. WordPress is proudly powering numerous top sites including TechCrunch, BBC America, Sony Music, and Best Buy. WordPress.com is a free version which lets you create a primary website with a subdomain (www.yoursite.wordpress.com). It is also the best alternative to Google Blogger, which again is a free blogging platform. Here your data is stored by WordPress on their servers, and they own it. On the flip side, WordPress.org is referred to Self-Hosted WordPress blog where you need to buy server space to host your site. There is a considerable difference between WordPress.com and WordPress.org. If you want to scale up and monetize your blog in future to make money online, then you need self-hosted WordPress. Since starting off my blogging career, I have only used WordPress as my blogging platform. Initially, I was using the free version but quickly understood that I wouldn’t grow big if I don’t invest few dollars. If you’re making the same mistake, then I would suggest you stop & rethink your blogging strategy. In today’s post, I will discuss the goods and bads of Self-Hosted WordPress. List of all the advantages of WordPress which makes it the best CMS for beginners as well as professionals. WordPress is an open – source CMS, and it’s free. It can’t get cheaper than free, right? Then why does everyone say you need an initial investment to start a self-hosted WordPress blog? Because you need hosting and Domain, which is not free. 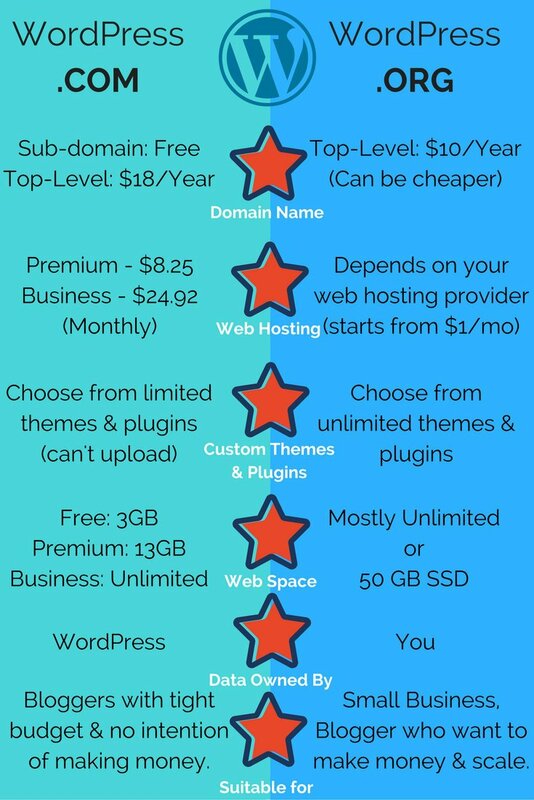 However, you can get web hosting for as little as $0.01 a first month with a top-level domain name for $1.99 for the first year. It will take only $2 to start your blog. So, you can skip your one cup of coffee and start your online presence. WordPress has a super simple navigation and dashboard. It would hardly take you 5 minutes to understand the underlying functionality of WordPress once you install it. WordPress doesn’t come up with any instruction manual (you don’t need it anyhow). If you require any support or help, just visit WordPress.org forum, and most of your doubts will be cleared. There are many third-party forums and websites such as WPbeginner to help you out. I can’t even imagine my hurdles of starting this blog if it was not with the help of plugins. WordPress has millions of Plugins including Free and Paid options to help you in every way possible. Want to add a contact form? There’s a plugin for that. Want to add social share buttons? There’s a plugin for that. Want to make your site E-commerce with cart system? You guessed it, there’s a plugin for that. There are Plugins for every problem, and you don’t need to learn to program to customize your blog. I haven’t written a single line of code, and I have a fully functional and beautiful blog live. WordPress is a CMS, so it has to be SEO friendly to make sure your contents are getting ranked. It allows you to change permalinks in an SEO friendly way, includes category and tags for better rankings. You can make it even better by installing Plugins like Yoast SEO to add meta description and see if you’re managing keywords density. Similar to Plugins, WordPress support millions of themes which are designed for every type of websites. It includes themes which are free as well as paid. If you want to start a blog as a hobby and want it simple, then free themes will suit your needs. Else, you can buy a premium theme which you can customize in every possible way. MyThemeShop is my recommended WordPress theme distributor. They have a vast collection of over 200 WordPress themes and plugins. Here, you can find a WordPress theme for a news site to personal blog, business site to cooking site and affiliate site to e-commerce. Whatever your needs are you will get a beautiful theme. All you need to do is upload the theme and tweak it. Once you’re satisfied with the design, hit activate. Unlike WodPress.com, you entirely own your self-hosted WordPress blog. All of its data, content, designs, everything you have created is the property by you. And you don’t have to worry about your site getting blocked all of a sudden. The point worth noticing here is that on a free blogging platform if your site gets banned you won’t be able to obtain your contents and any other critical data which you have worked hard to create. Don’t put all your eggs in a broken bucket; it’s better to move to a self-hosted blog right now. Everyone is saying that WordPress has security issues, and I am here telling WordPress is Secure. Am I out of my mind? No way, WordPress is secured. While I may agree that WordPress wasn’t very secure in its early days, it is now. With continued updates, WordPress has made itself safe. I can proudly say your site can’t be hacked quickly, and your data is secured. Change default username & password as soon as you install WordPress on your server. Don’t set your username as the name of your site. Also, don’t leave it default. Set a password of at least 16 words with a combination of words, letters, and special characters. Install Security Plugins such as Wordfence Security to keep it more secure. Sure there are more advanced WordPress security techniques available, but for me, these are enough. WordPress lets you add multiple users and create a multi-user site. It will allow them to post contents on your site. It is a great feature for sites which allows guest posting services. Now the good thing is you don’t have to change the password, username or another setting for a user every time he requests you. WordPress allows users to change their usernames, bio, password, and another particular setting, so you don’t have to worry about them. You can utilize your time in a more valuable work instead. You may have heard it a lot. Many believe in a lie that WordPress is Buggy. But, if you’ve used it and understand it then you would never say it. Like I am doing. I can say with confidence that WordPress is not buggy, the coding base of WordPress is stable. It’s up to you to choose the above things, and if you decide to use an inferior quality product then it’s not WordPress fault, is it? I always recommend my reader to use plugins and themes which have good ratings and compatibility. Do not just randomly pick-up a plugin from anywhere on the Internet and say WordPress is buggy. Also, cheap hosting will make WordPress buggy. If you’re serious about your website, don’t be afraid to spend few bucks on hosting. Enough of the goodness. Let’s now flip the side and see what WordPress lack. It’s not a problem with WordPress but with every other open-source service. Of course, there are 100’s of Forums and websites available to help you with any queries, it’s not that you always get what you need. You can’t directly ask your questions and get dedicated support from the customer service. It gets even worse if you’re a business person and wants help with something and there is no solution for it available on the internet. It takes the time to ask a question on a forum and wait for someone knowledgeable to reply and assist you. If you’re in a hurry, you will have to hire a professional for a 2-minute work which will cost you no less than $50. Unlike Blogger of WordPress.com, you can’t get started for free in the case of self-hosted WordPress. You can’t use any free sub-domain, and there are no good free web hosting services that will let you host your blog without any catch. But, the good news is you don’t have to invest thousands or even hundreds to host your WordPress site. There are many high-quality web hosting providers like BlueHost and SiteGround that provide shared hosting for as low as $3.95/Month with a free .com domain name. Another noteworthy mention to the list in InterServer (review) I’ve been using their service for quite some time now and never faced any major problem. They have one of the best customer support in the market and uptime guarantee. Moreover, you can try their web hosting for just $0.01 for the first month. No contracts and no yearly charges. While surfing the internet, you may have come across Gurus and their professional services which will try to sell their $400 plugin to you. And guess what, they are excellent at it. They will promise you all the big dreams and how they will do it for you for just $400. Also, make quick money schemes are widespread on the internet. There are few services and plugins which claim to help you earn $1000/month quickly and without any work. And how much do they cost? Only $25. If it’s that easy to make thousands of dollars with only $25, why don’t they make all the money instead of selling it? Sure there are some excellent and helpful services out there, but you have to think before spending your money. Think and do your research before you pay even a single dollar for these services. WordPress is great. It is the best thing that has happened to bloggers. It has all the abilities and functionalities to become the most popular CMS (which it already is). You can design a beautiful blog within minutes, and most of the themes are Search Engine Optimized that means you don’t have to worry much about the SEO part. If you’re smart and do your part of the research, you won’t face any issue in your blogging journey. I am not stopping you from following Guru’s but don’t follow them blindly. Know what is wrong and right and then spend your money on it. There are tons of paid ebooks and courses that are worth buying but do check positive reviews beforehand. Share your experiences and help me provide more value to this post. Share this post with your blogger friends and followers. And do not forget to pin images from this post to your favorite Pinterest Group Board. Your articles are really helpful for us. Thank you so much for sharing us. Great post, Shafi. Completely agree that WP.org is much better than the .com – and the good news is that it doesn’t have to be expensive for web hosting and domain names. Your article made my day. Shafi Khan, you’ve written it great. I didn’t know about the bad and good facts about self-hosted WordPress but your review post made my mind clear. Hi, it was a really good article. Thanks for sharing. Completely agree with you on this one. If people don’t want to make money and just want exposure, I’d suggest going with Medium instead. Frankly speaking, I cannot comprehend why someone would go with WordPress.com in today’s age when its so cheap to go the self-hosted route and platforms like Medium are available. Which one do you find better – Medium or WordPress.com? You don’t own the content on both the platforms so that would be an interesting comparison. Either way, my suggestion would be to just start with a self-hosted blog from the beginning since it has become cheap as the peanut. Keep visiting and commenting Saubhagya. Agreed. Medium is more inclined towards professional writing and knowledge. You have written a helpful post for the bloggers. Thanks for including my blog post. Keep blogging! Self-hosted WordPress is much better alternative than WordPress.com if you are planning to start a professional blog. It will cost you some money but it definitely worth the money. Agreed. Self-Hosted should be the only choice if you want to scale big. The investment required is almost negligible as one can get started for as low as $12 for the first year.